Tailored to entertain, well-paced, fun, funny, slick and occasionally silly, Jackie's newest film fits him like a glove. While Tucker impressed me in Jackie's last "Rush Hour 2," Chan appeared to be on auto-pilot. Here, though the the martial arts scenes are fewer in number and shorter in duration, they beem brighter with creativity and humor. In fact, each scene in "The Tuxedo" shines with careful attention to entertainment, humor and fun. Cabbie Jimmy Tong (Chan) stumbles into a job as chaufer for infamous, infinitly smooth, spy Clark Devlin and soon enough finds himself in the thick of Devlin's mission. Donning a tuxedo with all the dial in functions a would-be spy needs including a few others just to amuse the careful viewer (like "mash-potatoes"). Watch closely for the little touches, such as the inclusion of "Sting" on Devlin's list of close friends. This time Jackie pairs with Jennifer Love Hewitt as the smart, but hard, new recruit; their sarcastic chemistry works. Though cartoony, the actual plot rolls well; an apt framework for amusing antics and fun asides that all come together to create a fine night out at the theater. Both Jason Isaacs (as Clark Devlin) and Ritchie Coster as (bad guy Banning) perform strongly; the smooth Devlin character complements perfecly the innocent Cabbie Jimmy Tong. About his stunts Jackie says, "I'm crazy, but I'm not stupid. When I'm planning an action scene, I know how far I can go, how high I can jump... When I create a stunt, I have confidence that I can do it. If I think I cannot do something, I will not do it. I would not risk my life." 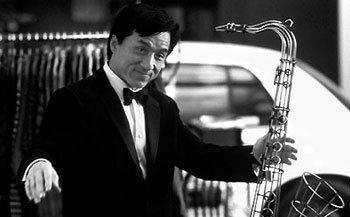 According to the production notes, Jackie's audiences ordinarily expect his moves to be real, but because of the tux's powers, Chan felt he was able to push his otherwise viewer-limited bounderies for special effects. The Tuxedo. Copyright © 2002. Starring Jackie Chan, Jennifer Love Hewitt. Screenplay by Philip Hay & Matt Manfredi, Michael Wilson, Michael Leeson. Produced by John H. Williams, Adam Schroeder at DreamWorks.